Great for your next trip outdoors. 10 of the lovely all natural Fatwood firelighters in a plain and simple eco friendly cotton drawstring bag. A fantastic all natural firelighter, also known as Maya Stick. Fatwood is a completely natural pine wood that is very high in resin and this resin gives the product this wonderfully easy ignition. With such high resin content there is no need to add any chemical additives! What's more it is completely eco friendly as our Fatwood comes from the stump of a tree which has been used for it's timber and would otherwise be wasted. Once the tree has been harvested the stump is left in the ground until the follwing spring, when the roots produce the natural resins again. Those resins become concentrated in the stump which is then used to make the 100% Natural Fatwood Firelighters. All you need to start your fire is one or two sticks of Fatwood and in a matter of minutes, you’re fire is usually roaring. There's no need for kindling, just light a stick or two of Fatwood, put them under your chosen fuel, sit back and enjoy. 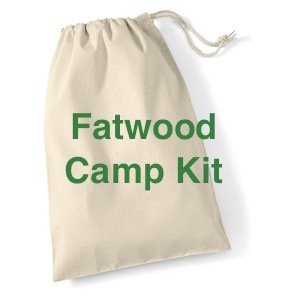 This Camp Kit holds 10 of the lovely Fatwood Sticks all kept nicely in an eco friendly natural cotton drawstring bag, complete with a little instruction leaflet. Fatwood is the ultimate firestarter in any weather. Fatwood is extremely easy to light, even when wet - perfect for Britsh Summer Time then!! Our Fatwood burns with a hot aromatic pine flame that makes the perfect firelighter for wood fires, BBQ's, stoves at home or outdoors.